UVK licenses can only be purchased from our website. Click here to purchase a license now. You can also get a free, fully functional 14-day trial license from this page. Before purchasing a license, we recommend that you create an account. This will help you to buy our products faster and easier, and also recover your licenses and invoices in the future, should they ever get lost or deleted by accident. Payments are processed by PaPal, which supports credit/debit cards and most common payment methods. Once you complete the payment in PayPal's website, you are automatically redirected to a page that contains links to download your license and invoice. Those links are also sent to the email address associated with your new license. If you can't find the email message, then it may have been diverted by SPAM filters.Check your SPAM or BULK folders. Also consider adding carifred.com to your trusted domains list. As mentioned above, we recommend that you you create an account before purchasing our products. If you own an account in our website, you can download your product licenses and invoices anytime directly from your user control panel page. Please keep in mind that UVK licenses are provided as a file, not a text code, as in some other applications. Once the license is delivered to you, don't try to open it with a text editor to copy its text. Think of your license as a file and not a code. This is the recommanded method for PRO and Branding licenses, but it will not work for OEM or Tech OEM licenses. This method also works for TRIAL licenses, and allows you to automatically activate UVK in every machine you run it. 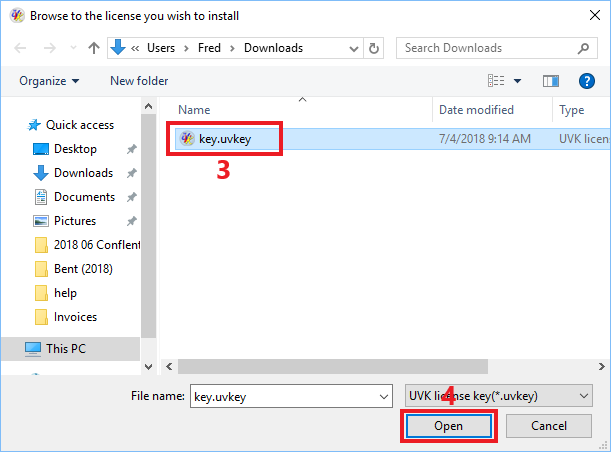 Simply place your license file (key.uvkey) in the same directory where you have the UVK packages you usually install UVK from, as shown in the picture below. For instance, in the root of a USB pen drive, place UVKPortable.exe and key.uvkey. 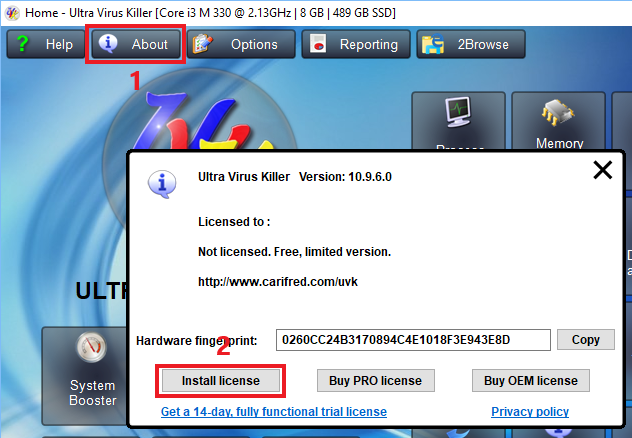 You can also use UVKInstaller.exe or UVKPortable.com. If you own a branding license, please also place your logo file in the same folder. 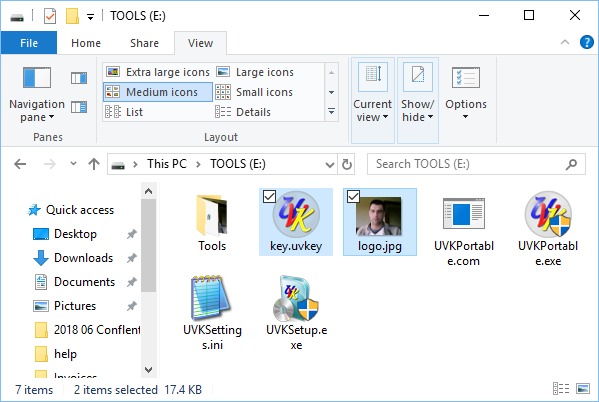 In the picture above we can see the the license file (key.uvkey) and also the logo picture (logo.jpg) were placed in the same folder as UVKPortable.exe, UVKPortable.com and UVKInstaller.exe. When running any of those packages, the application is automatically activated. Application customized settings are automatically loaded from UVKSettings.ini, which we previously saved to the same folder. After downloading your license file in the target computer, you can quickly activate it by opening it directly from your browser. The procedure is different in each browser. For instance, if you're using Google Chrome, you just need to click the key.uvkey button in the lower left corner of Chrome's UI. 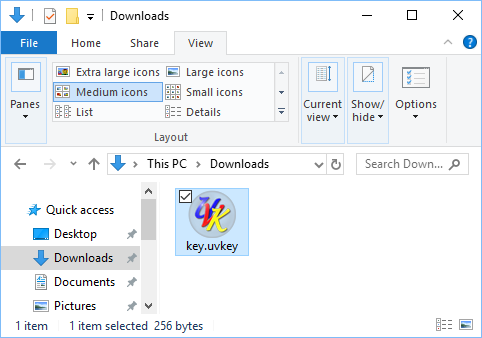 You can also activate your downloaded license from the Windows File Explorer. You just need to access your Downloads folder, and double-click the license file, as shown in the picture below. The picture above shows a UVK license file in the Downloads folder. Most browsers place the downloaded files there. Note that usually you will see many other files in that folder, so you will probably have to scroll down to see your license file. If you prefer to activate your license from UVK's interface, lauch UVK by double-clicking its desktop icon, and when the main UI shows up, press the About button (1). Then, in the About dialog box, press the Install license button (2). Select your license file (3) and press Open (4).